Established in 1980, Touro Law Center is fully accredited by the American Bar Association (ABA) and is a member of the Association of American Law Schools (AALS). In addition to the regular J.D. program, Touro Law offers two programs specifically for foreign-law graduates – one is a Two-Year J.D. Program, the other is a 27-credit LL.M. program in U.S. Legal Studies. The Law Center occupies a dynamic 185,000 square foot, state of the art building in Central Islip on the south shore of Long Island. Touro Law is at the center of what is arguably the nation’s first integrated law campus, comprising a United States courthouse and federal building and a New York State court center, with supreme, family, and district courts. Located about one hour by car or train east of New York City on Long Island, Central Islip boasts a wide variety of affordable housing options. Students may also use the Office of Admissions’ Housing Information Network, which provides current listings of accommodations, as well as information regarding carpools and shared living arrangements. On-campus parking is free of charge. The Law Center provides free shuttle service for day and evening classes between the Central Islip train station and the law school. Students can choose to live in Manhattan or Brooklyn and commute to school via the Long Island Railroad. Touro Law is a leader in bridging the gap between law school and legal practice, and between the classroom and the courtroom. Taking advantage of its unique location as part of a law campus adjacent to and working with both a federal courthouse and a state courthouse, Touro Law offers an innovative Court Immersion Program that enables students to experience the workings of the judicial system from the very first days of their legal education. Touro Law is the only law school in the country where first-year students are exposed to true legal practice through simulations in both litigation and nonlitigation settings and through faculty-supervised small group visits to courts in session, court-related agencies, and court administration. In an effort to facilitate experiential learning, Touro Law invites students not only to observe live proceedings, but also to discuss with the participants (judges, attorneys, and sometimes the parties themselves) their perspectives on law in action. 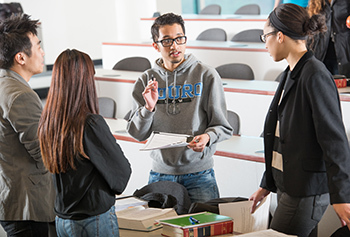 Touro Law’s curriculum is a cutting edge program that reconceives and restructures the law school experience for all students. The curriculum expands the scope and quality of legal education by focusing on the development of legal professionals, from prelaw through postgraduation.